"No Beat Needed, I Cover It All"
Here’s how you can to attend “Summer’s Last Stand” – the 2017 edition of the North Coast Music Festival. 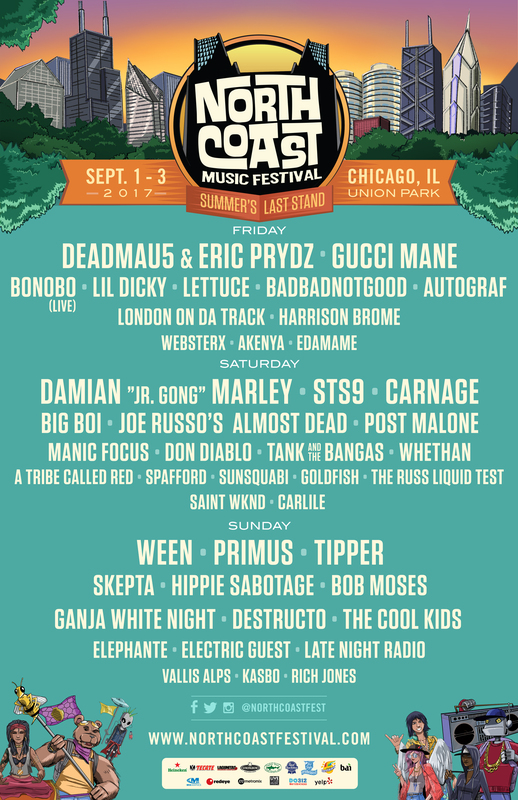 Gucci Mane, Deadmaus5 & Eric Prydz, Skepta, Hippie Sabotage, The Cool Kids, Carnage, are just a few of the huge names that are to performing live as part of NCMF at Union Park on September 1-3rd. Once again, Journalist Without A Beatis back to giveaway a ONE PAIR (2) of 3-Day General Admission tickets to the North Coast Music Festival! It’s quite easy to enter – just follow the instructions below. Tag a Friend and comment on the post above with the artist(s) you are most excited to see! The winner will be entered into a random generator and will be announced on August 17th! Don’t forget that 3-Day, Single Days, and 3-Day VIP tickets are still available to purchase, HERE. Must be 17+ to enter. Contest ends August 17th. Winner of contest will receive (1) pair of tickets to the North Coast Music Festival on September 1st-3rd. Tickets are not transferable and will need to be picked up by the winner on the day of show with valid photo I.D. in order to claim their tickets. Winner will be notified on the day contest ends. If said person doesn’t respond in a reasonable time, a new winner will be chosen. – Journalist Without A Beat… Out!